Mangaluru, June 30, 2017 : Sea erosion has intensified in Ullal as every year. Huge waves are lashing at houses close by the sea shore. As of now temporary sea wall works are underway . 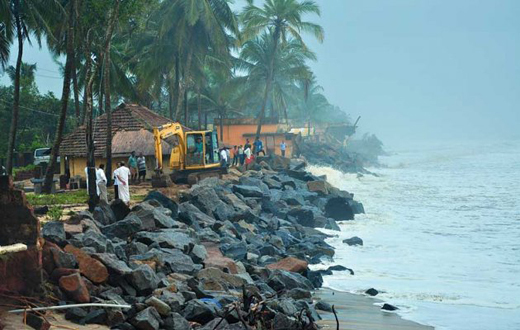 Meanwhile, two ganji kendras will start functioning in the area from today to provide relief to those affected by sea erosion in Mogaveerapatna, Kaiko, Kileria Nagar and other places. If one Ganji Kendra will function from the Mogaveerapatna school, another Kendra will function from the Ombattukere Government School. As of now many affected families are seeking shelter in houses of neighbours. The boulder dumping works as a temporary measure is underway in the affected areas. On Thursday, Assistant Commissioner Renuka Prasad, Tahsildar C Mahadeva and Ullal TMC Commissioner Vani V Alva visited the place and inspected the works. The sea erosion is the problem persisting every year, with what risk the fishermen build houses in this region close to the sea?